Excessive sweating can be really stressful and embarrassing and can lead to discomfort, odour and conspicuous staining of clothes. ODABAN® Spray is gentle and effective, offering 24-hour protection for most areas of the body. ODABAN®’s unique, hermetically sealed pump spray helps prevent product degradation and its precise and constant dose avoids over application. Providing too much is, in fact, one of the main reasons why antiperspirants can be irritating to the skin. Whether making an important business presentation or holding hands on a date, no matter the ambient temperature, ODABAN® will bring you freedom to concentrate, and of course, a new found confidence. 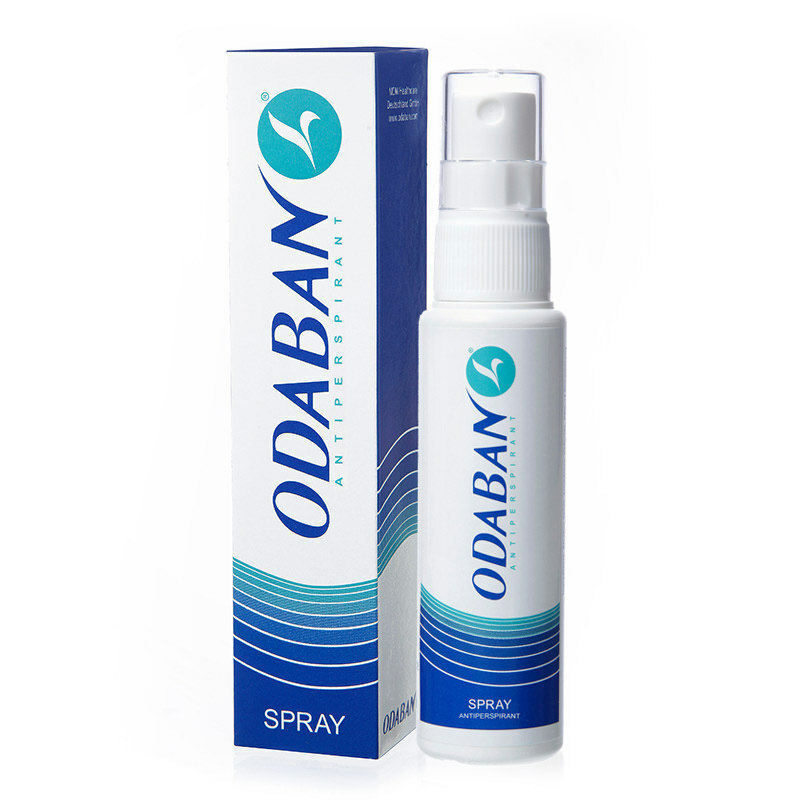 ODABAN® Spray has long been used worldwide to protect against excessive sweating. The convenient and unique pump spray is 100% free from perfumes and allergy inducing ingredients. ODABAN® contains a tried and tested formulation of 20% aluminium chloride in a silicone and pure alcohol base. The product is subject to stringent quality and production controls that guarantee user satisfaction. ODABAN® is suitable for all skin types and with its unique formulation and packaging delivers a suitable amount to help protect against excessive sweating without undue irritation. ODABAN® is an easy to use pump spray. Apply only at bedtime as directed. Remember less is more, use sparingly and within a few days, most individuals will find they are getting the protection they have been looking for. ODABAN® can be used over most areas of the body. Using ODABAN® Spray is simple. The product must only be applied at bedtime, when relaxed. It is very important the skin is perfectly dry before application, as ODABAN® will react with moisture to cause skin irritation. Use a hairdryer or a little talcum powder to dry the skin prior to application and afterwards in the event of over application. ODABAN® Spray must be applied sparingly; one spray is usually sufficient. Women and those with sensitive skins should always apply ODABAN® Spray indirectly with a cotton wool pad. When applying to the underarms, apply only to the central armpit area (3 to 4cms diameter) where most of the sweat glands are located. The skin must be washed the following morning; other products are unnecessary but can then be applied without interaction. Men’s skin is generally thicker than women’s and the presence of underarm hair will also help protect their skin from over application with ODABAN® Spray. One or two sprays can therefore be applied (from about 10cms) directly to the central armpit area. Any excess application can be absorbed with a tissue. Most users of ODABAN® Spray will find they achieve the protection they have been looking for within a few applications, however, it may be necessary to continue with nightly applications until the problems are resolved. Once protection is attained, try to gradually reduce the number of weekly applications, often one or two applications is all that is required. Remember less is more, apply ODABAN® Spray sparingly for the best protection. Should too much product be applied the poral plugs will completely block the sweat ducts, which will result in an eventual bursting of the poral plug barrier and a return to the original excessive wetness. In this case it is necessary to rest the skin a few days and then restart application but remembering to use ODABAN® Spray more sparingly. It is important to apply ODABAN® Spray only to areas of excessive wetness, do not apply to large skin areas and do not apply to mucous membranes or broken skin. ODABAN® Spray is safe to use all over the body but take care to use a cotton wool pad, especially around the area of the head. Apply to the scalp by carefully parting the hair and dabbing sparingly with a cotton bud. Frequency of application with ODABAN® will often vary with each individual, just take your time and gradually reduce the rate and amount of product used to achieve and then maintain protection. ODABAN® is especially formulated for individuals with excessive perspiration, however, anyone can use Odaban, especially if looking for protection that can last up to a week. Odaban Antiperspirant Spray is available to buy online now.